We redesigned the global BBDO.com website and created a template for local BBDO office websites. Another UX Designer and myself led the entire UX design process for this project, and we worked closely with Visual Designers, Producers, Developers and New Business/Marketing stakeholders to bring this project to life. BBDO.com, the global website for BBDO Worldwide, needed a facelift. Not just a facelift, but an entire overhaul. Its design was outdated and not robust enough to meet the business needs of internal stakeholders, and the needs of current & prospective employees. *These are screenshots of the BBDO Chicago website, however it's the same template that was used by BBDO.com before the redesign. The website excluded work that wasn't video. The design of the website wasn't flexible enough to showcase a variety of work formats (print, OOH, video, websites, mobile apps). As such, it provided a very narrow view into the work created by BBDO globally. The website mostly showcased work created by BBDO NY, since it was being managed and maintained from the NY office. It was much easier to obtain media for work that was created locally, so it could be quickly uploaded to the website. The CMS being used to maintain the website was cumbersome, exacerbating the resource and time constraints dedicated to managing BBDO.com. We were also asked to assess the value of BBDO's intranet, since they were thinking of redesigning it from scratch. Before we dived into any designs, we began a research phase in order to clarify any existing assumptions and make sure we weren't missing any opportunities. We began our research phase by identifying our target audience for the website, which included current employees, prospective employees, and potential clients. 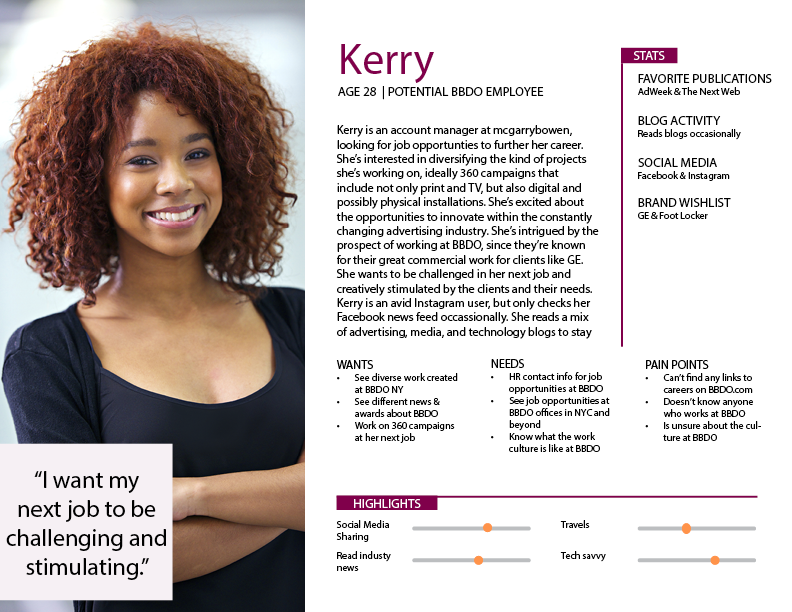 We were constrained to just one week for user research, so we interviewed current employees and extrapolated what we could for prospective employees, based on their experience going through the hiring process at BBDO (and our very own!). Understand their perception BBDO as a global company. Understand their background, what they do at BBDO, and how they got to BBDO. Where, when, and why they visit BBDO.com (before the redesign), and how they identified different pieces of content. Determine if they could complete certain tasks in the BBDO website and the BBDO intranet. Display the best work being done by BBDO offices around the world. Showcase BBDO's competence at storytelling across all media and platforms. Ensure content is easy to find, and encourage further discovery & exploration. 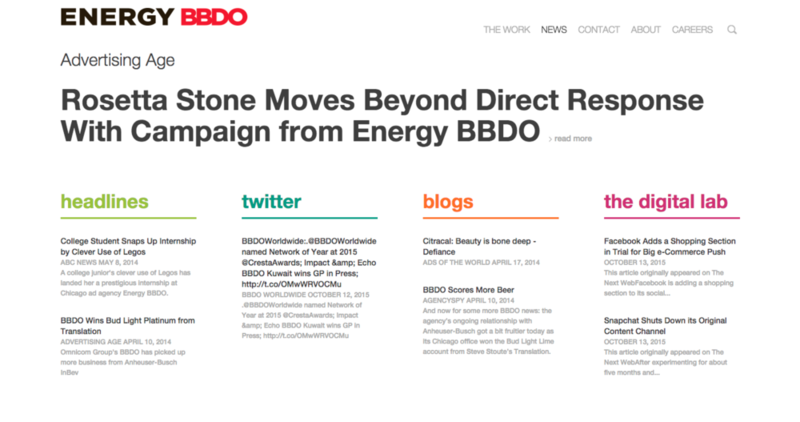 Make BBDO.com a destination for current employees to stay up-to-date on the latest client & industry news. Let prospective employees search for job openings and learn more about the culture at BBDO. Give current employees a centralized and user-friendly destination for tools, templates, HR policies, and internal resources. 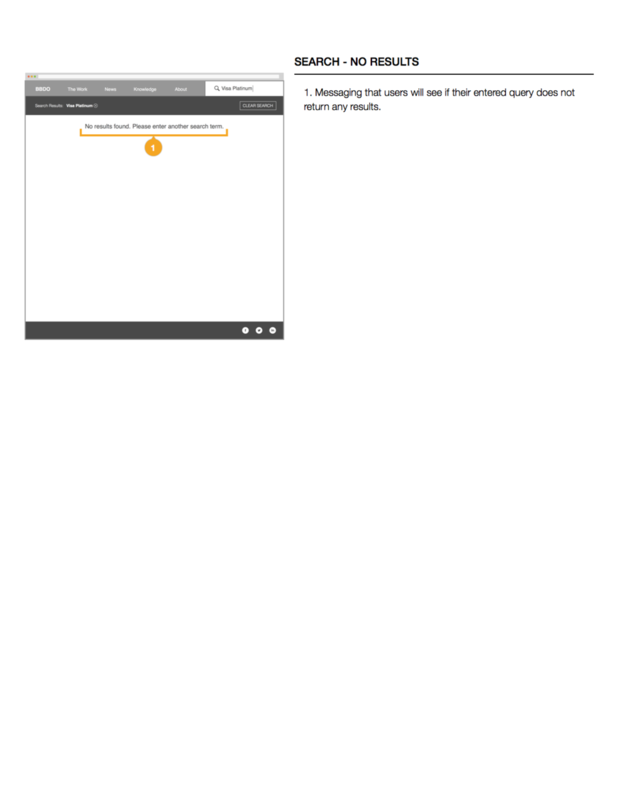 Redesign the CMS from scratch so the website is easier to maintain. Properly addressing our goals and the problems that the previous BBDO.com faced would require re-thinking the entire framework. We began this second phase of our process by creating a site map, so we could align internally on the content buckets and how they're related to each other. One key finding from user interviews was the confusion around what office was represented by BBDO.com, since it was meant to be a global website but it mostly featured work from the NY office. Our recommendation was to create a standalone website for the BBDO NY office, so BBDO.com could truly be a global site. This led to the creation of a local site template, which we designed to meet the various needs of BBDO offices around the world. There would be three types of content (Work, News, and Digital Lab) that would be visually represented through a tile design. Content will be tagged; content can be filtered; content can be featured. Content categories should look and feel different from each other. With these in mind, we determined the main content buckets for BBDO.com would be "Work", "News", and "Knowledge". We created the "Knowledge" category to meet the internal need for both long-form and short-form blog posts and thought pieces. This effectively supplanted the "Digital Lab" category, since most employees were confused about what the Digital Lab was, and those outside of BBDO were even more confused about it. The "About" section would be pretty straightforward, while the "Locations" page would support the international feel of BBDO.com, allowing users to find contact information for BBDO offices around the world. The main pieces of content (Work, News, and Knowledge) would be tagged to allow for further discovery & exploration throughout the site. With these content buckets mapped out, we began sketching different iterations of the homepage and the individual "Work", "News", and "Knowledge" pages for both mobile & desktop. 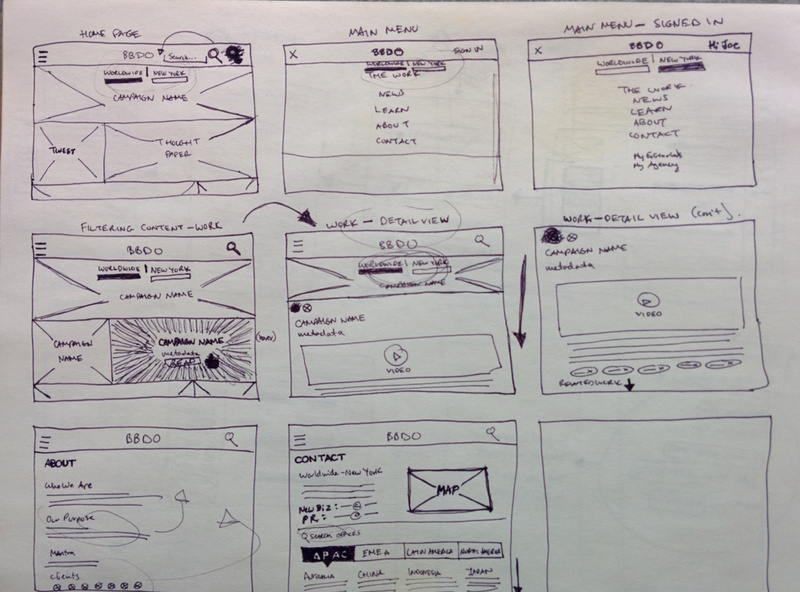 Next, we began creating annotated wireframes to flesh out all the functionality and interaction patterns. My partner and I worked together first on the mobile wireframes, divvying up different pages and features (for example, my partner designed the home page and main menu while I focused on the Locations, About, and Knowledge pages). 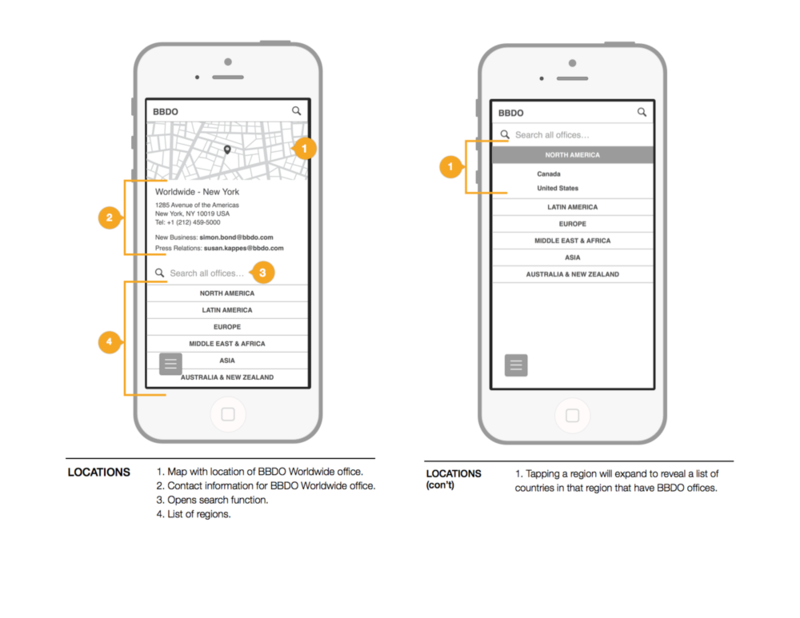 Below I've included sample annotated wireframes for the Locations and Search features. We iterated on these wireframes about 7 times, after many meetings with internal stakeholders, designers, and developers. We also used InVision prototypes to quickly test different interactions and make sure users could find the information they were looking for. This helped us narrow down our features and remove superfluous interactions, like downloading PDF versions of Knowledge content, that users wouldn't actually use. At this point in the design process, my partner and I split up the remaining duties: she took over designing the CMS, while I took over designing the desktop experience. 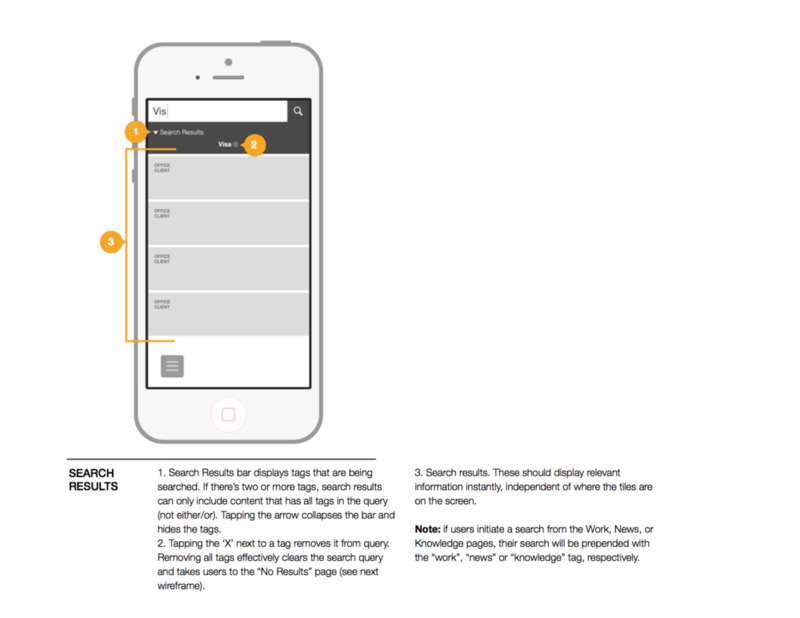 Below I've included sample annotated wireframes for the same features detailed above, Locations and Search. Using more time - at least two weeks - to conduct user research with all target audiences and a more thorough competitive analysis. Having dedicated time to prototyping and user testing. Given time constraints, we were able to do this 'guerilla-style' with only specific features/tasks. BBDO.com was just the beginning - the creation of the local site template was quite possibly a more complex endeavor. The first local website, BBDO.nyc, should be launching early next year - stay tuned for that case study!